Socio-Political-Journal... : EU BOSS: WE'LL BREAK UP USA! 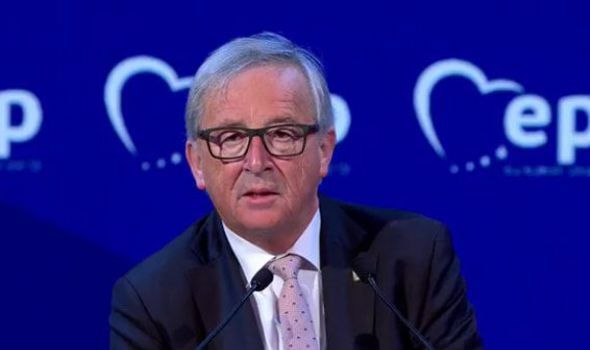 Mr Juncker's comments did not appear to be made in jest and were delivered in a serious tone, although one journalist did report some "chuckles" in the audience and hinted the EU boss may have been joking. The remarks came in the middle of an angry speech in which the top eurocrat railed widely against critics of the EU Commission. They will be seen as totally inexplicable at a time when EU-US relations appeared to be on the mend, with Vice-President Mike Pence having completed a largely successful trip to Brussels and the commander-in-chief himself significantly softening his tone towards the EU project. Mr Juncker did not criticise Britain at all during his speech, and only made reference to Brexit in relation to Mr Trump and the opportunities it presents for Europe to reform itself. Speaking before him, EU Council president Donald Tusk was less reserved in his remarks about the UK vote as he tore into the populist politics which led to Brexit. The Polish eurocrat said the argument over sovereignty - epitomised by the Vote Leave slogan ‘take back control’ - was “a view that is both foolish and dangerous” and that the EU guaranteed countries’ strength of the world stage. He said: “We shouldn’t be ashamed of saying we’re Christian. We’re Christian, it is our history. “If we leave our identity we will have in Europe all identities but not European identities. For this we need to strengthen our identity.